The Virtual Boy's Golf places you on to an 18-hole course as you compete against 47 opponents to try and win the tournament. That's pretty much it. Compared to, say, the latest Tiger Woods MotionPlus offering it doesn’t offer much, but does the opportunity to tee-off in 3D make it worth a try? 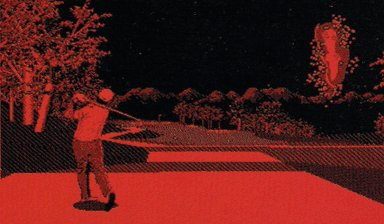 Perhaps more than any other game, Golf is where the redness of the Virtual Boy really stands out, as being placed in an environment of red trees and grass is very strange. There is no detail to the grass and so the rough, fairways and “greens” are differentiated by a different shade which allows you to tell what is what – although water hazards are not always obvious. However there is a great variety between the holes on the course and the 3D is very effective, giving you a good sense of the size of your surroundings and the distance you are from the hole. When it comes to putting you may find yourself judging how much power to put on your shot based on the distance you can see, rather than the number telling you how far away you are. The game gives you a lot of control over your shot. After picking your club, you can adjust your shot direction and stance. Once happy with this you are then faced with the power meter and this is followed by a target moving across the ball, determining where you will hit it. Like in many golfing games these last two steps are based on timing, so it can be frustrating to not quite pull off the shot you intended due to not putting the required strength on it or clipping the ball on the side when you wanted to hit it straight. Of course giving players complete control over these steps would remove all challenge from the game so pre-motion controls, it had to be done. There are a range of clubs available: woods, irons and wedges which you use for a variety of different situations. The further the club will make the ball travel, the faster the power meter moves. The ball behaviour is correct, travelling the right distance and direction, taking into account wind and terrain. Landing on a slope causes the ball to roll as expected whilst hitting a tree kills the momentum of your ball with irritating accuracy. There is just the one course in the game and disappointingly the weather remains the same (dry). Even if the programmers couldn’t stretch to a second course, a variety of weather types would have provided an additional set of challenges. Aside from the tournament mode you can also select ‘Stroke Play’ where you can play (and practise) any of the holes on the course. Strangely the game seems like it initially had a save feature, but this was then removed. There are seven player files available with record screens for them as well as course records, but this information is lost as soon as the power is switched off. This is unfortunate as trying to beat your own records or competing against those of another player would add a lot of replayability to the game. Thankfully the game does save your progress through the game with the use of passwords: as playing 18 holes can take a long time this is a welcome inclusion. Audibly the sound effects are good with satisfying cracks as you hit your shot, dull thuds as the ball bounces and a rattling noise as the ball drops into the hole. The music, sadly, is not so good, with just the one track that plays: a quite cheery tune that brings to mind a sunny day. It gets quite repetitive and so soon annoys but luckily T&E Soft include an option to turn it off. There’s no difficulty option in the game so it can be quite tough to place highly in the tournament whilst you get used to the controls, but as you improve it’s fun to replay the tournament and watch yourself slowly move up through the rankings. Just having the one course however does limit the amount of times you’ll feel the need to replay the game. 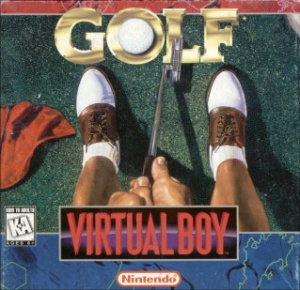 Whilst competing against the virtual players is fun, what would really add to the replayability of the game would have been a two-player option, but then this is the Virtual Boy, and multiplayer is a rarity not to be found here. Golf features impressive use of 3D and provides players with a lot of control over their shots, with obstacles and wind affecting ball movement in a way that feels accurate, meaning it does a good job of immersing players into its virtual course. Sadly it’s let down by its lack of multiplayer and records that are lost as soon as the Virtual Boy is turned off. A second course or even just a second set of weather conditions would help to extend the life of the game but sadly neither is available. Overall, Golf is an excellent virtual representation of the real thing but cannot be considered an essential purchase. Forest? I don't get it. I think FORE is a golf term. The save feature mystery is very strange. Are you sure it wasn't just a case of the internal battery being dead after 12 years? I think James knows what Fore means. Incognito - Nope, most VB games didn't have battery back up. I think Chicken meant first, but also wanted to be on-topic so he said "FORE-st". Edit: Good review Dave, BTW on the original Virtual Boy, could you turn the red tint to a different color, all of the red would get annoying after awhile. Brings back memories of the AVGN review. 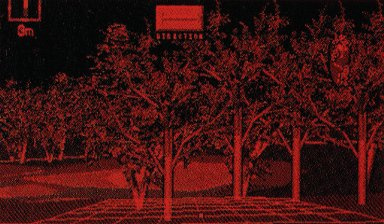 "If there's any colour I'd imagine Golf, its anything but ****ing red and black! As Damo said above, very few VB games had battery backup (and this wasn't one of them). Funny Incognito should mention a dead battery though as a while back the battery died in my VB Wario Land. @pie4prez: I can't think of any cases where you can change the shades of red in a game, but a few did feature brightness settings. I used to play the hell out of this game and loved it. However, the real reason why I played the hell out of this game was because there was no games out lol. Even though only 22 virtual boy games were released, only 14 of them made it to north america lol. 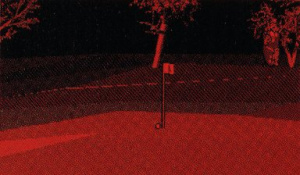 Despite all this, I still wish and hope for Nintendo to release the virtual boy games on the Wii U or 3DS eshop. Actually, the 3DS is a no brainer because the players has the ability to turn the 3D on/off on their Nintendo 3DS's! I am really curious to see how the virtual boy games look on the Nintendo 3DS with the 3D turn all the way up on the highest setting.